Routen Farm, home of Wild Wool, a stunning, hidden gem in the Western Lake District. Routen Farm overlooks Ennerdale Water and Crag Fell in the shadow of Great Bourne, placing it at the heart of the Western Lake District fells. Isolated from the hustle and bustle of main roads, Ennerdale has a distinctive rugged tranquility and is home to flocks of Herdwick Sheep. 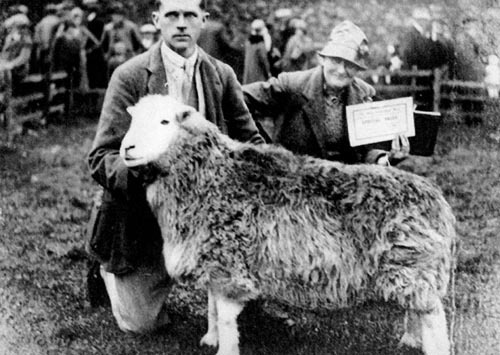 It is thought that Beatrix Potter’s Herdwick sheep could have been related to the breeding stock from the valley, and it is the wool from these original flocks that is used to create products in the Wild Wool Workshop. Also on Routen Farm, The Wild Wool Barn, provides luxury bunkhouse accommodation for groups of up to 6 and a small campsite offers a rare opportunity to camp in isolation overlooking the stunning views of Ennerdale. In the workshop Susan Denhan-Smith, spins and weaves, knits, crochets, and felts the local Herdwick wool using traditional methods. She holds regular craft classes and takes talks and crafting out into the community. Weekend and residential courses are available where you can take Herdwick Wool from the Fleece to the floor, making your own rug, whilst surrounded by the stunning views and flocks of Ennerdale. Susan also takes commissions to create rugs and accessories and can often be seen working in the studio/workshop. Some of her creations are available for sale at the workshop and on this website. If you love traditional crafts, active holidays in the mountains or just want to get away from it all, Routen Farm and the Wild Wool are the perfect place for you to escape to. You can walk out of the door and directly onto the the Ennerdale Horseshoe. WIFI free and with no mobile signal you can leave the stresses of everyday life and reconnect with yourself and nature as you discover the "wild valley" of Ennerdale. Routen Farm is rumoured to have been visited by Beatrix Potter in 1934 when she was the President of the Ennerdale Show. The show office was housed in the farmhouse (now the family bathroom!). It is also thought that Beatrix Potter’s flocks of Herdwick sheep could have been related to the flocks which still graze here. It is wool from these, the oldest flocks of Herdwick in the country, that Susan uses to create her products.